Remember Eloise the children's book character? She was a little girl who lived in the Penthouse of the Plaza Hotel. I am sort of like her except I am an adult and I live at the Sunninghill Guest Lodge. My husband and I live here temporarily and we live in a regular room which is not the penthouse. Over the years, I have spent a lot of time in hotels. At one time, for my job I traveled about 40% of the time. However, I never stayed in one place longer than a few days and I didn't spend much time during the day hanging around the hotel. We've been staying at the Sunninghill Guest Lodge since February 18th and we'll be moving into a house that we rented on April 1st. That means six week of living at the guest lodge. Mr. Deep goes to work everyday so I spend a lot of time here by myself. Fortunately, the Sunninghill Guest Lodge is really lovely. Of course we are excited to move into our house as it will be wonderful to have more space and to be reacquainted with all of our belongings and furniture. But in a way I will miss the lodge. What will I miss? First of all, breakfast is included in the cost so every day after Mr. Deep goes to work I go and have breakfast by myself. While you can order eggs, I eat this every week day morning. I may have also indulged in the occasional croissant. Second, the staff here are so friendly and nice. When you are alone in a new country smiling people who say hello and ask how you are every day is really appreciated. Living here, I notice how hard the staff work. 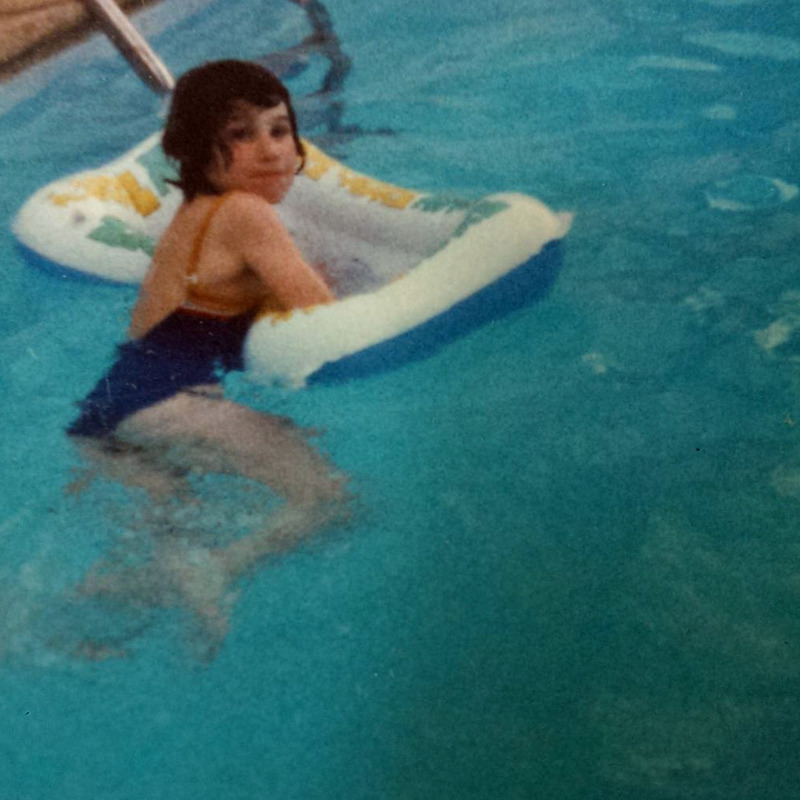 Once, around the time people were rocking out to Nirvana, I worked as a chamber maid at an Inn for the summer. It's a hard job and it can be yucky to clean people's rooms. Everyone here takes so much pride in their work. Unemployment is really high in South Africa so they probably are truly happy to be here. In addition to the maids, there is a gardening/maintenance staff of men. While they do use an electric lawnmower and a sprinkler system, everything else is done by hand. Raking, using a pitchfork to pull up weeds, trimming foliage, all by hand. The grounds here are so pretty and it's due a lot of hard work on the part of the staff to keep everything looking so nice. Third, the neighborhood. 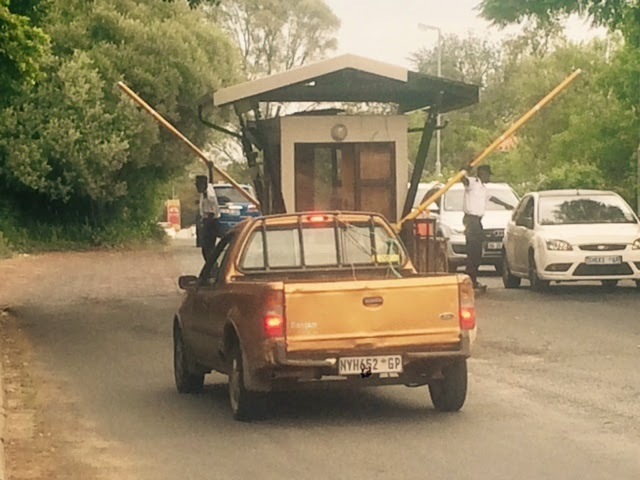 Security is a big concern in South Africa so there is a main gate you have to pass through to get into the neighborhood and then in addition the guest lodge has it's own gate. Every weekday I run and walk around the neighborhood which is called Sunninghill Gardens. I'll do another post about the neighborhood before we move. Here are some additional pictures from the lodge. Isn't yellow and white a great color combo? Also behind the dining room a small garden. I recognize pepper and basil plants. Not sure what else. Neat pictures. I think that the gate is actually what is called a "boom" in South Africa. I'm not entirely sure as I have never seen a picture of one before just read about them in real estate listings. Yes! It's a boom. I didn't know that at the time that I wrote this post.